Battle of the Books 2010! 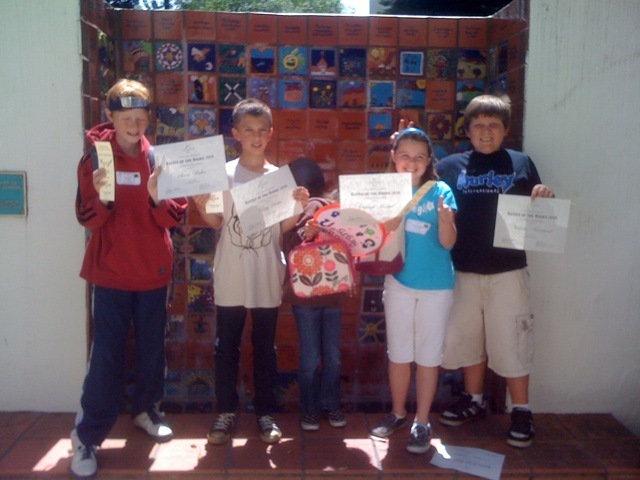 Congratulations to our 2010 Battle of the Books Team for a great job at this year’s event. On Thursday, April 15, we traveled to the County Schools Auditorium to do battle with over 300 students from around the county. Our team this year included Soren, Oakleigh, Nicholas, Perry and Kailea. Kindergarten–Oliver, the cat thought that staying out all night was a splendid idea until his owner locked the door and turned out the lights. After some adventures in the garden things turned spooky with owls and possums and finally rain! Fortunately for him his owner relented and allowed him in the house. But in typical cat fashion he thinks he’s the one doing her a big favor! Night Cat by Margaret Beames is a delightful read aloud and has dark, exciting illustrations by Sue Hitchcock. First Grade–Mucky Moose by Jonathan Allen is the hilarious story of a moose and a wolf and their ridiculous interaction regarding the possibility of the moose as the wolf’s dinner. After several failed attempts to eat the smelly moose, the wolf decided to leave the forest and become a guide dog for the blind! Something about this story really tickles the funny bones of first graders and it becomes a laugh out loud read aloud! Second Grade–Second graders had to solve a mystery this week. Who took grandpa’s teeth? In Rod Clement’s clever book , Grandpa’s Teeth, they discover it was and inside job but not before the whole town becomes suspect. As we learned, watch out for smiling dogs…..
Third Grade–Last week we read Saving Sweetness by Diane Stanley and this week it was the sequel, Raising Sweetness. After living with the sheriff for awhile the orphans keeps asking, Pa, you ever thought about gettin’ married?” Spaghetti and peanut butter dinners and windows washed with butter become an emergency and little Sweetness learns her letters so she can answer a letter from Lucy Locket, the sheriff’s long lost love. All turns out well in the end as the sheriff and Lucy “get hitched.” Another great read aloud and lots of examples of similies kept third graders wishing for yet a third sequel! Fourth Grade–To understand the literary device of plot, fourth graders heard Lily and the Wooden Bowl by Alan Schroeder. This beautiful tale has many elements that are similar to the plot of some well known fairy tales. Students had a great time finding those similarities and it helped them to see what a plot is and how many stories are based on older versions with the same story line. Fifth Grade–We had one of those “technology moments” this week as fifth graders were set to do an online scavenger hunt using World Almanac for Kids Online. The morning of the lesson I found that the site had been compromised with a virus and we made a quick switch to doing the hunt just using Google. This made it quite a bit more challenging but students stuck with it and did a great job! Sixth Grade–Sixth grade started their research this week on their gods and goddesses. This will be part of a collaborative project with Art in which they are making ceramic plates of a Greek god or goddess. We loved having you and your students at Battle of the Books and hope to see you again next year! It is an event that our department loves putting on because it is so much fun, and we are always so impressed with the students who participate!